Baz Luhrnman’s The Great Gatsby is an audacious, fascinating technological and aesthetic experiment in expressionism, a “kaleidoscopic carnival,” to borrow Fitzgerald’s phrase, as bursting with bejeweled excess as its title character’s boozy parties, the cinematic equivalent of the biggest, craziest, loudest guest at a gathering where the confetti falls and the champagne flows like monsoon rain, and the twenties really roar their golden roar. Everything shines in baroque, brilliant, beautiful fakeness. A lavish, splashy celebration of the extravagance of the Jazz Age, Gatsby is filled to the brim with the sort of stylistic gambits Luhrman fans have come to expect—epic, classic melodrama that blends old world theatrics with the newest in postmodernist subjective filmmaking, CGI cityscapes, anachronistic soundtrack mashups of period music and modern pop, psychological drama and speedy slapstick. But through the brightly-hued haze of acrobatic camera movements, opulent flowers, flappers, fringes, and frills, Luhrman’s reverence for his source material shines through like the blinking green beacon of light at the end of Daisy’s peer. Although his candy-colored Prohibition New York, layering the swagger of modern hip-hop over the decadence of ragtime piano, is about as accurate as the depiction of Belle Epoque Paris is Moulin Rouge, overall, this Gatsby sticks close to the details of its literary inspiration, Luhrman lifting hefty passages of dialogue and description directly from its source. 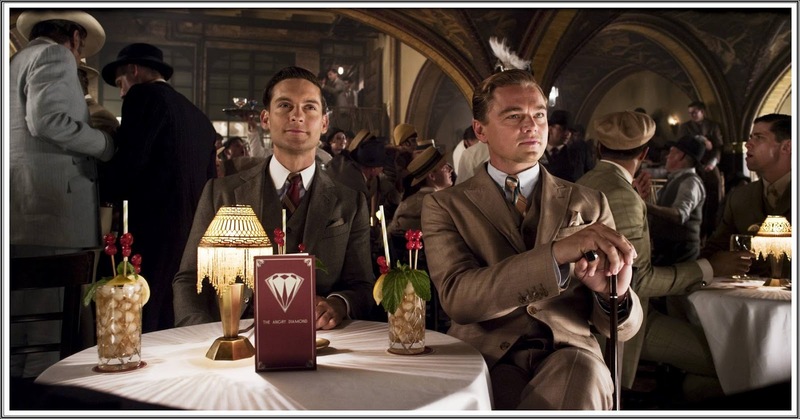 The film begins with narrator Nick Carraway (Tobey Maguire), writing a memoir from the confines of an asylum. Although a point of divergence from the novel, this framing device is hardly a blasphemous indulgence. But is it necessary? Some of us still like to think of Carraway forever preserved on the “thrilling returning trains of my youth,” his idealism shaken but not shattered; instead we get a depressive, anxious, sleepless alcoholic in a mental institution. The story he tells is well known, a trenchant tale of love, loss, wealth, corruption and staggering ambition. 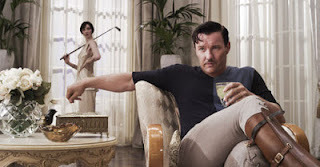 The single best thing about Luhrman’s film is the self-invented, self-deluded Jay Gatsby (Leonardo DiCaprio) himself, played as an unreal, mysterious, mythical projection of his own psyche made achingly real by DiCaprio’s performance. The movie arguably reaches its peak 30 minutes in with his masterful introduction, accompanied by an explosion of fireworks and the merging of reality and illusion over the strains of Gershwin’s “Rhapsody in Blue” and the magic and romance of half-remembrances of other times and other places. With Carraway’s help, Gatsby, who now lives in a house vaguely resembling a Disney palace that might strike Charles Foster Kane as excessively large and vulgar, plans to lure back Daisy (Carey Mulligan), a dazzling debutante he’d loved and lost when he was younger and poorer. Fitzgerald describes his title character’s smile as “one of those rare smiles with a quality of eternal reassurance in it, … [that] faced—or seemed to face—the whole eternal world for an instant, and then concentrated on you with an irresistible prejudice in your favor. It understood you just as far as you wanted to be understood, believed in you as you would like to believe in yourself, and assured you that it had precisely the impression of you that, at your best, you hoped to convey.” DiCaprio, through his precise gestures, body language, and voice, creates a man seen not as what he is, but as what he would wish, at his best, to be, what others see and understand him as. The actor’s blue eyes match the azure of Gatsby’s pool in both color and depth, creating an anguished portrait of magnificent proportions—a shimmering enigma, an omniscient false idol of crystallized illusions shattered and toppling from his pedestal, romantic, beautiful, delightful, terrifying, and pathetic all at once. 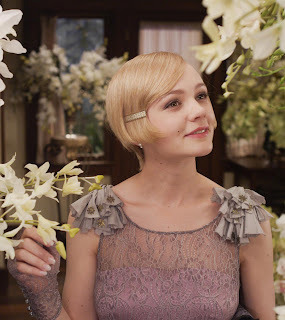 Daisy Buchanan, the girl that got away and the purpose for the main character’s ill-gotten fortune, in the novel a glimmering figment of Gatsby’s fantasies, is also humanized. The film never idealizes her as Gatsby and even Nick do. She surfaces as a complicated, contradictory individual with complex thoughts and feelings, although the actress lacks the harshness of the source material’s character, a woman with a hard, narcissistic edge and a “voice full of money” who, along with her husband “smashed up things and creatures and then retreated back into their money or their vast carelessness or whatever it was that kept them together, and let other people clean up the mess.” Tom Buchanan (Joel Edgerton in a stand-out, scene-stealing performance) captures the jovial arrogance of a “hulking” brute, a bully and a bigot impersonating a cultured man with money. Some of the best, most intimate scenes transpire between him and Gatsby, and real emotions poke through the film’s gleaming, well-manicured surface. Fitzgerald’s seductive prose is what made Gatsby truly great, and the depth and delicacy of feeling the author packed into every sentence is lost in Luhrman’s movie. A bit too literal-minded in its symbolism—we get it about that billboard, already!—this Gatsby’s biggest flaw is in its unwavering enthrallment with surface over depth. In Luhrman’s world, nothing means a thing if it aint’ got that bling. Everything looks just right—thanks in no small part to director of photography Simon Duggan and costume and production designer Catherine Martin—but feels off. Taking what is perhaps the greatest American literary achievement of the 20th century and focusing on all the great shiny stuff seems stubbornly superficial. At its most opulent, the film becomes performative rather than immersive, keeping us at an emotionally distant, dreamlike remove that is always bigger, louder, and lusher than life. Which is not to say the film isn’t immensely enjoyable and utterly, breathlessly alive. Although too carefully choreographed against a bright storybook backdrop of unreal perfection, Luhrman brings Fitzgerald’s novel to throbbing life in this hyper-real, hyperactive, hyperbolic adaptation. Swooping, swirling, and swerving much like an amusement park ride, a calculated mix of refinement and vulgarity, Luhrman’s Gatsby transcends artifice and becomes art. It jumps off the screen but remains just out of the grasp of greatness.